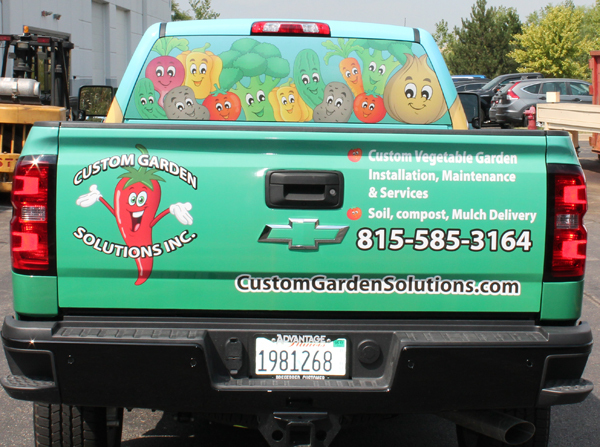 As you can see, the fleet wraps we did for Custom Garden Solutions are all about color and fun! Who says you have to be dull and boring? Why not enjoy yourself instead? Get stunning fleet graphics for the Chicago area. Contact us or call (630) 289-7082. 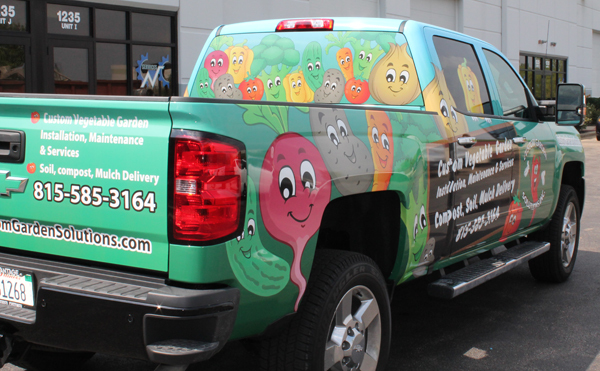 Also, when someone sees these colorful trucks cruising around, they’re sure to remember the name and webpage. Then when they visit, they see the same smiling faces, and the visitor knows they are in the right place. This is consistent branding, and it helps build confidence and trust. When potential customers encounter your brand in more than one place, they accept your name as a reliable source. Make sure your fleet graphics and website all deliver the same brand message. Pick-up trucks are especially amenable to fleet wraps. Why? Because the tailgate graphics are sure-fire attention grabbers. Take a look at how it’s done. The rectangular tailgate shape is perfect for laying out all the important info you want to share. Make sure you include a phone number and website address. Again, how can anyone resist the smiling veggie graphics? Anybody waiting in traffic behind this vehicle is certain to notice. Obviously, you want to go 360 degrees with vehicle fleet wraps. This guarantees visibility from all angles. Just look how great it turned out for Custom Garden Solutions. So no matter where the truck is in traffic, the brand shows up. This is one reason why fleet wraps are such an effective advertising tool. Each vehicle can produce thousands of impressions - which means it may be seen by thousands of people every day. That’s smart advertising. It’s also a smart way to take advantage of a business asset - your vehicle fleet - in more ways than one. Get high quality fleet graphics for the Chicago area. Contact us or call (630) 289-7082. Title: Who Says Fleet Wraps Are Boring?